« Can a Hunter Change Professions at Kindu’s School for the Deaf? Monday, 4 April 2011, a plane of the UN mission to DRCongo, Monusco, crashed on landing at the Kinshasa airport, N’djili. 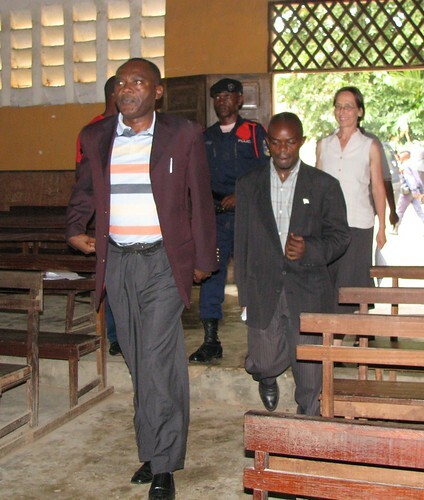 Thirty-three people lost their lives and among them, Mendes Masudi, who was Vice Governor of Maniema Province in 2009. Mendes Masudi, in front, arrives to give the opening speech at our first big workshop in Kindu. As vice-governor he was our strongest ally in the provincial government. He pushed hard to get the first no-hunting season established. He wanted six months with no hunting and no bushmeat in the market. Finally a three month season became law. 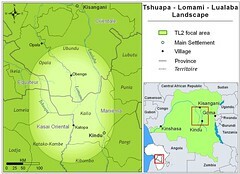 It was his staunch support that gave credibility to the case for conservation of Maniema’s rich Lomami hinterland. Congo’s forests have lost an advocate. Alas. This entry was written by Terese Hart, posted on 2011-04-06 at 8:15 am, filed under uncategorized. Bookmark the permalink. Follow any comments here with the RSS feed for this post. Post a comment or leave a trackback: Trackback URL. I am so sorry to hear this. He sounds like a wise and compassionate man. My condolences. So tragic to lose a good man and a supporter of DRC’s forests and wildlife. A severe blow on many levels. I am so sorry. My sympathy to all who knew Mr Masudi.